The Peach State's largest solar farm-one of the largest solar power projects in the eastern U.S.-involved some major civil work and getting through some tough Georgia weather, but thanks to advanced planning, the project was finished ahead of schedule. The 30-MW Social Circle solar project-by far the largest solar power project in Georgia (the Peach State)-started over a chance meeting, as some renewable energy opportunities often do. Silicon Ranch Corporation President/CEO Matthew Kisber and company Vice Chairman and COO Reagan Farr had agreed to meet with a friend about an international business idea. The idea didn't pan out, but in that meeting, Kisber was introduced by the mutual friend to songwriter and music executive Steve Ivey. 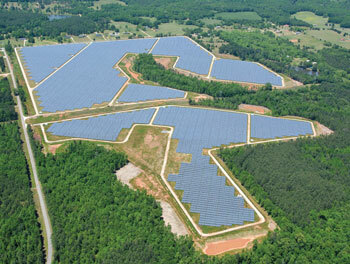 In passing conversation, Ivey mentioned that his family owned acreage in Social Circle, Georgia, a region of the state that Kisber and Farr had been considering as a possible location for a major solar generating facility. One thing led to another, and within nine months, Silicon Ranch had closed on the long-term lease of 175 acres of the Ivey property, on which the company would build one of the largest solar farms in the eastern U.S.
Fast forward to May 2014 when the new Social Circle Solar Farm was officially christened during a formal ceremony held in the center of more than 130,000 JA Solar modules. Kisber and Farr were joined by dignitaries from the Georgia Public Service Commission, Georgia Power, and Phoenix Solar AG, the German-based parent company of Phoenix Solar, which built the project. Kisber commended the Georgia Public Service Commission and the State of Georgia for their vision in embracing solar generation in such a large and meaningful way. Silicon Ranch is proud to have built-and now operate-the largest solar farm in the eastern half of the United States, he added. "Silicon Ranch's successful financing and construction of this dynamic project demonstrates our company's ability to execute large and complex transactions," he said. Farr thanked Walton County government officials, who he said embraced the Social Circle solar project and helped bring it to fruition. Dr. Murray Cameron, CEO of Phoenix Solar, noted Social Circle is the largest solar electricity system that Phoenix Solar has built in its 14-year history. The high-profile project further demonstrates Phoenix Solar's commitment to move its operational focus to high-growth regions, including the U.S. and Asia, he added. Silicon Ranch says it is one of the top 15 solar developers/owners/operators in the U.S. Over the past three years, the company has spearheaded solar projects throughout the U.S., including a major 9.5-MW solar farm for Volkswagen's Chattanooga automotive manufacturing facility in the neighboring state of Tennessee. The Social Circle solar farm was the largest project Silicon Ranch has tackled to date-and getting to the christening date this past May took a lot of work. According to Kisber, there were a number of attributes working in favor of the Social Circle property located 45 miles east of Atlanta. 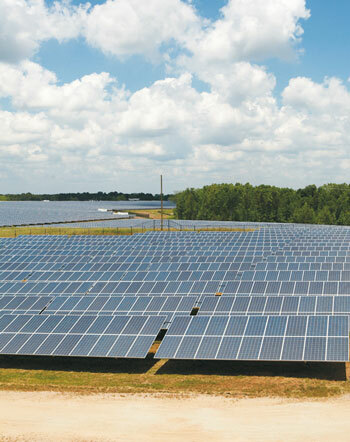 Its close proximity to an existing Georgia Transmission substation was very convenient given that much of the power the facility generates is supporting Georgia Power's solar demands. Another key positive factor was the timing of the project's launch. A number of groups in Georgia had been advocating for moving ahead with utility scale solar power projects-and the Georgia Public Service Commission acted on that in 2011 with a 50-MW solar pilot project. "We were fortunate to secure 30 MW of that original 50 MW with the Social Circle solar farm," said Kisber. Through 2012, Silicon Ranch proceeded with the soft aspects of the project, including the layout, design, and financing. "We had a lot of work to get done, getting the land re-zoned and getting the preliminary development work completed," Kisber said. Since Georgia is still relatively new to solar power-unlike a state such as California or New Jersey-there was some education with stakeholders, including local government and utility representatives. Silicon Ranch officials were happy to walk government officials through the project, as well as provide them with regular updates. The background of the company's senior executives prepared them well for this approach, says Kisber. The chairman of Silicon Ranch is former Tennessee Governor Phil Bredesen. Kisber, who served as Tennessee's economic development commissioner, has an extensive banking background and served 10 consecutive terms in the Tennessee House of Representatives. Farr, who also has extensive financial expertise, is a former commissioner of the Tennessee Department of Revenue. "What we all have in common is service in the public sector, an understanding of the process and the need to educate, and an understanding of the value and importance of consensus building to create win/win opportunities," says Kisber. "We think that has helped us secure success with the projects that we have done." 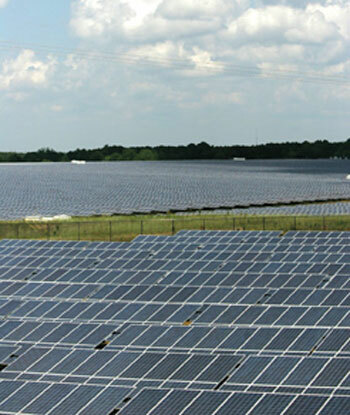 Once Silicon Ranch had secured the 30-MW power purchase agreement with Georgia Power, construction of the Social Circle solar farm was expedited. During construction, numerous challenges, including a wet Georgia weather season, had to be overcome. The Social Circle solar project site, 45 miles east of Atlanta, is now home to more than 130,000 JA Solar modules. Unirac racking and SMA inverters were also used on the Social Circle project. "We like to say that if any region is having problems with drought conditions, the way to fix that is to give us a solar project there," joked Kisber. "With the last few solar projects we've done, they've had drought conditions and it quickly moves into almost monsoon rain once we start construction." Silicon Ranch's EPC partner on many of its solar projects-including the Social Circle project-is Phoenix Solar USA, which builds solar projects internationally. Its North American headquarters are in San Ramon, California. Peter Candelaria, vice president of operations at Phoenix Solar USA, noted that they were looking to complete the project ahead of schedule and avoid the risk of potential weather-related delays-which they did-but it took a lot of upfront planning and carefully managed execution. "Rather than take a standard approach and assume a typical weather year, we front- loaded the schedule with an aggressive kick-off to the Social Circle project," he explained. "The intent was to gain as much ground as possible in the first few months and adjust our burn rate once we had achieved certain milestones," says Candelaria. During construction, though, the weather in this area of Georgia went from drought conditions to above normal precipitation, with records set on a number of days. But they were positioned well for this. "Since we loaded the project upfront, the rain did not have as much of an impact on us as it could have," he said. This part of Georgia is known for its silty clay soil, which added to the effect the rains had. "In this type of soil, it does not take much rainfall to shut a project down. Once saturated, these soils are not conducive to standard construction traffic, and you are forced to wait until the site has sufficiently dried before re-starting certain work activities." At some points, a lot of construction activities were planned around the weather-the team looked at weekly, daily, and sometimes hourly forecasts to plan out work. Phoenix Solar was resourceful in its approach to the weather and other challenges. "In order to deal with the rain on both the Volkswagen and Social Circle projects, we built temporary manufacturing facilities with the use of large industrial tents," explained Candelaria. "With this particular project design, you can incorporate a panelization process, which allows you to assemble the solar modules into a larger nine or ten module panel, which is then mounted on the racking." Unirac racking was used on both the Social Circle and the Volkswagen projects. JA solar panels and SMA inverters were used on the Social Circle project. "By incorporating this manufacturing center in the field, the team was able to continue this panelization process, rain or shine. This method proved to be very helpful-allowing the team to make up some of the time we had lost to weather." Performing through all this was the subcontractor on the project, Crowder Construction of North Carolina, who originally had to pass muster with Phoenix Solar and Silicon Ranch. "We went through a very thorough vetting process early on," says Candelaria. "A lot of our execution team with Phoenix Solar comes from the utility space, so we are very careful and conservative in how we vet our construction partners." That extends to reviewing a company's safety record, experience, financial wherewithal, resumes of the supervisory staff, and their backgrounds and relevant experience. Social Circle was the first solar project Crowder Construction had ever done. Needless to say, they had the necessary experience and resources to gain the confidence of Phoenix Solar. Candelaria said they are able to partner with smart and well-positioned companies that are new to solar because of the experience and technical know-how Phoenix Solar (which started in Germany in 1999) is able to bring to a project. "We have the German DNA and many years of experience," he says. "Our team is made up of energy people who have done many power projects, substations, conventional, and solar projects-we are well versed in this space and know what it takes to build power projects from start to finish." The project had a tremendous amount of civil work compared to a typical solar project, requiring 750,000 cubic yards of earthwork. "In that respect alone, it was a legitimate heavy civil project, with grading, drainage, retention ponds, and basins." Before they did any of that, the site had to be cleared-about 75 percent of what was once a former cotton farm was grown over with trees. During construction, numerous challenges, including a wet Georgia weather season, had to be overcome. While the Social Circle solar project was being built, the weather in this area of Georgia went from drought conditions to above normal precipitation, with rain records set on a number of days. But the biggest challenge of the project was unexpected. This area of Georgia is well known for Stone Mountain, a massive piece of quartz monzonite rock with an elevation of 1,686 feet at the summit and a circumference of more than five miles at its base. The Social Circle property had its own, much smaller, submerged stone mountain on part of the site. "Rock is indicative of this area, and we found a similar feature subsurface on our site," says Candelaria. Two geotechnical engineering firms had surveyed the site, and neither found any significant presence of rock. "Although we expected to encounter a few exceptions." The piece of rock was one big exception. "We had to do something creative to get the rest of the solar power capacity installed and keep the project on time and on budget," he said. Part of the solution involved taking an entire inverter station, including the associated array, and moving it to the laydown yard. "This may sound simple in concept, but there was a lot of work to make this happen." The handling of the rock situation was a key part of the success of the overall project, says Candelaria. "Those kinds of issues can have a huge impact on a project if they are not dealt with the right way." The Social Circle project is only the beginning of what looks to be a promising future for solar power in Georgia. Since the initial solar power move in 2011 by the Georgia Public Service Commission, the PSC directed Georgia Power to procure another 210 MW of solar power by 2016. And last year, Georgia Power, on its own initiative, announced that they were going to procure another 200 MW by 2017. "Georgia will have gone literally from zero MWs in 2011 to well over 500 MW in only six years," said Silicon Ranch's Matthew Kisber. Silicon Ranch is exploring further opportunities to develop solar power in the state. "We have been working to identify sites and develop opportunities in Georgia, and we believe we're well positioned for growing our business, considering the experience we have there." Kisber noted that Silicon Ranch is also investigating opportunities in other parts of the country, with utilities as the offtakers. They are also looking at different approaches, such as large scale distributed energy, which is what they did with Volkswagen in Tennessee. "We worked with TVA, the utility in that region, to set up what is now the first behind-the-meter, large-scale distributed solar power project in the TVA region, with the power sold directly to Volkswagen," Kisber said. "We'd like to work with other customers on similar projects. We feel our niche in distributed generation is in the 2 to 50-MW range, so we're working on a number of opportunities in that space."